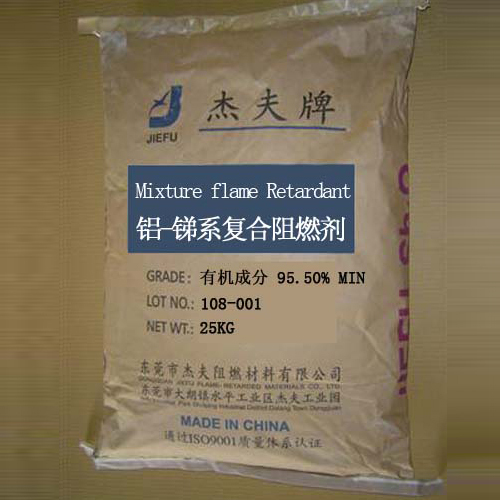 Al-Sb compound flame retardant is made of halogen flame retardant, antimony trioxide and aluminum hydroxide additives conjunction. It not only can anti fire, but also can prevent the smoke, reduce droppings and toxic gases. It can be used for PVC, PE, rubber, and substitute some uses of antimony oxide, has higher cost-effective compared to pure brine class flame retardant. White powder, non-toxic, odorless, good dispersion, high whiteness, low iron content. Packing：In 25KG or 40KG Double-coated ploy wrapped bag. Transportation: This product is non-dangerous goods. Prevent moisture, rain and packing damaged during transportation.